Five PNNL technologies were named to the prestigious R&D 100 list of top technologies by R&D Magazine on Nov. 13. 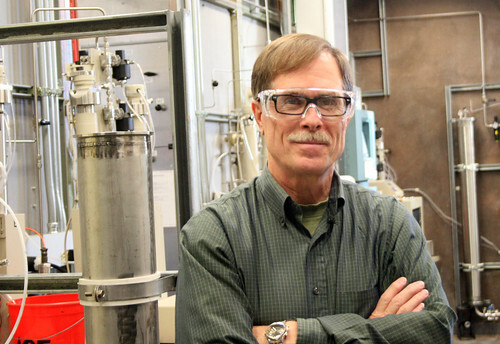 Doug Elliott, who led the team that developed the hydrothermal processing technology. 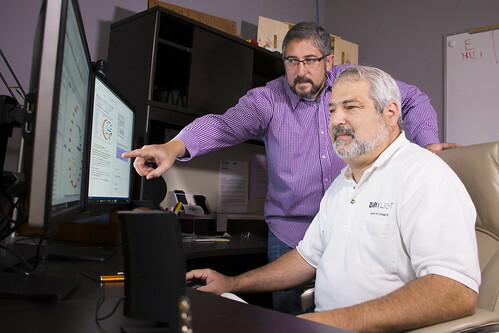 Cybersecurity software developed at Pacific Northwest National Laboratory learns about a company to better protect it. Called CHAMPION, the software can reason like an analyst to determine if network activity is suspicious. It then issues an alert in near-real-time. PNNL Shawn Hampton (left), Champion Technology Company’s Ryan Hohimer (right) and their teams received an R&D 100 Award for developing this technology. PNNL's Power Grid Integrator has demonstrated up to a 50 percent improvement in forecasting future electricity needs over several commonly used tools. Project lead Luke Gosink, right, consults on the use of the new tool, which could save millions in wasted electricity costs. 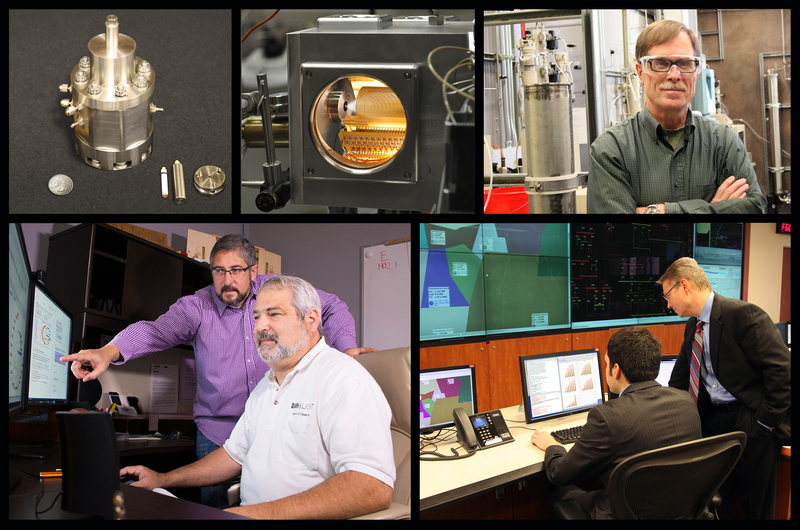 RICHLAND, Wash. — Technologies that impact cyber security, increase our ability to detect trace amounts of chemicals, convert sewage into fuel, view energy processes under real-world conditions and forecast future electric needs are among the newest R&D 100 award winners. R&D Magazine honored five advancements developed by researchers at the Department of Energy's Pacific Northwest National Laboratory at an event in Las Vegas on Nov. 13. R&D Magazine selects the 100 most innovative scientific and technological breakthroughs of the year from nominations spanning private, academic and government institutions. These honors bring PNNL's total to 98 since the awards' inception in 1969. "I am pleased that PNNL and our researchers have been honored with these prestigious awards. They recognize not only the innovation of the individuals, but also the impact that the Department of Energy national laboratories make in addressing the most challenging problems facing society," said Steven Ashby, director of PNNL. "These inventions, and so many others coming out of our national labs, will help to keep our nation safe, competitive and prosperous." If you're a hacker aimed at stealing credit card information from a retail company and you want to evade detection, massive amounts of network data are your ally. Analysts have the know-how to sort through this digital mess, but they often identify attacks too late. Analytical software developed at PNNL can help find these and other threats in near-real-time. That's because the software, called Columnar Hierarchical Auto-associative Memory Processing in Ontological Networks or CHAMPION, has the knowledge to sort through data like an analyst, but on a much greater scale. Cybersecurity isn't CHAMPION's only trick. Change its diet of knowledge and the software can learn to analyze financial services or health care data. PNNL licensed the software to Champion Technology Company Inc. to pursue all three applications. The CHAMPION development team includes PNNL's Shawn Hampton, Rick Berg, Katya Pomiak and Patrick Paulson; Champion Technology Company's Ryan Hohimer, Alex Gibson and Peter Neorr; and former PNNL scientist Frank Greitzer. At the heart of mass spectrometry is the ability to precisely measure tiny samples of substances such as chemicals in soil and water or cancer cells in a tissue sample. Collecting the most molecules possible into the device is a key step: the more molecules, the more sure scientists can be that their findings are accurate. The latest work builds on a previous PNNL creation of a device known as the Electrodynamic Ion Funnel. The ion funnel comprises a series of electrically charged rings that effectively funnel charged particles of interest into a small space where they can be measured and manipulated. But collecting those particles and getting them into the ion funnel is challenging. Many of the ions simply escape before passing through the small aperture into the funnel. The new development, known as SPIN or Subambient Pressure Ionization with Nanoelectrospray, eliminates this problem by removing the aperture completely. 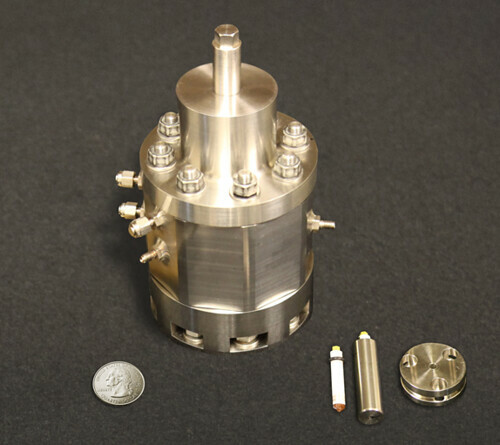 The ion source now creates and sends particles to the funnel in a single system under the same atmospheric conditions, at just one-tenth the atmospheric pressure on top of Mt. Everest. The net effect? 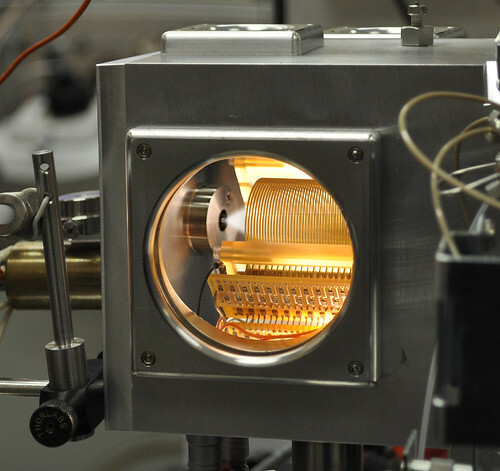 Nearly 50 times as many gas-phase ions enter the mass spectrometer than without SPIN. That could mean greater sensitivity for assessing runoff of chemicals in soil, for example, or the ability to catch signs of cancer in the blood earlier than was previously possible. A new chemical processing system can convert natural substances as diverse as waste treatment sludge, food scraps and algae into a variety of useful fuels. The system is remarkably efficient, in many cases converting 99 percent of a feedstock like algae into fuels, including biocrude oil, which can then be refined into aviation fuel, gasoline, and diesel fuel. The process also produces another fuel — methane gas — as well as clean water and useful plant nutrients such as nitrogen, phosphorous, and potassium. Exotic though it sounds, the ability to make useful fuels out of biological materials like plants has long been possible. The difficulty has been doing so economically. The technology created by the PNNL team hurdles previous challenges by making it possible to skip a long, expensive, energy-intensive step that most processes require — drying out the raw material. Instead, the PNNL process works directly with the wet slurry of raw material, be it a waste stream from thousands of homes, scraps from a food-processing facility, or long strands of algae. Alternate technologies typically recover much less energy from the raw material — often about one-third as much energy — and they typically cost much more. They also generally don't also produce other useful substances, such as clean water, burnable gas, and fertilizer. Utah-based Genifuel Corp. has licensed the technology and built a pilot plant for its partner, Reliance Industries Ltd., to create biocrude oil from algae. The PNNL team is also working with the Water Environment Research Foundation to demonstrate the process's effectiveness with municipal wastewater. The team includes Doug Elliott, Dan Anderson, Rich Hallen, Todd Hart, and Andy Schmidt, as well as James Oyler from Genifuel. A PNNL team created a way to make a sophisticated scientific tool much more useful for a variety of studies, including several aimed at answering important questions about energy and the environment. The method boosts our ability to look at complex samples under conditions that more closely mimic their real-world environments. The technology brings together the power of nuclear magnetic resonance spectroscopy, which yields a remarkable peek into molecular interactions, and the ability to re-create the extreme conditions found on the tundra, in the deep ocean, or underground — conditions relevant to some of the biggest questions that scientists at DOE laboratories such as PNNL ask. In the past, scientists have not been able to analyze solid materials, such as soil, minerals, biomass, biological materials or other structures, using NMR spectroscopy in its most effective mode, known as "magic angle spinning," while the samples were held under the high pressures or temperatures relevant to real-world reactions. The trouble is, once the samples are removed from those conditions, their physical properties or reactions can change significantly, limiting the usefulness of the data. The new technology allows scientists to tap NMR spectroscopy to watch molecular interactions as they occur in conditions that mimic their real surroundings. Exploring the chemistry and other effects that occur when carbon is stored underground in a process known as carbon sequestration — an approach designed to reduce the amount of carbon in the atmosphere. Recreating the conditions found in fracking wells deep underground, where ultra-high pressures rule. Tracking the complex chemical reactions that occur when new biofuels made from plants are upgraded to useful fuels like gasoline or diesel fuel. The multidisciplinary team is based largely at EMSL. The team from EMSL and PNNL includes David Hoyt, Jian Zhi Hu, Jesse Sears, Eric Walter, Hardeep Mehta, and Kevin Rosso, as well as former PNNL researcher Flaviu Turcu. Accurately forecasting future electricity needs is tricky, with sudden weather changes and other variables impacting projections minute by minute. Errors can have grave repercussions, from blackouts to higher energy costs. The Power Model Integrator is a new forecasting tool that delivers up to a 50-percent increase in accuracy and the potential to save millions of dollars in wasted energy costs. 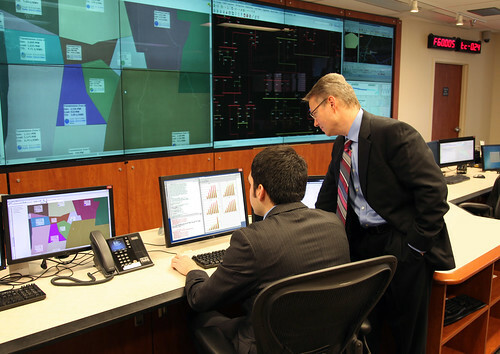 Energy forecasters working for utilities and other power organizations currently rely on a combination of personal experience, historical data and their own preferred forecasting model. Each model tends to excel at capturing certain grid behaviors, but not necessarily the whole picture. The Power Model Integrator simultaneously evaluates multiple models and determines how to best combine those models to make a single forecast that more accurately predicts future power needs. More accurate energy forecasts help reduce excess power generation, decrease the need to suddenly buy emergency power at a high cost and reduce the energy's carbon footprint. The Power Model Integrator team includes PNNL researcher Luke Gosink as well as former PNNL researchers Ryan Hafen, Alex Venzin, Maria Vlachopoulou, Ning Zhou and Trenton Pulsipher.